It’s probably a legacy from my days as a member of the “accountants’ union”, but I’ve always had a respect for the worker bees in Tower Hamlets council’s over-stretched finance department. They do a difficult job in very tricky circumstances and they have to deal with all manner of politics from members and senior officers. But they probably won’t thank me for highlighting this piece of legislation that may well add to their workload. Under the Audit Commission Act, every council must for a four week period throw open its books for public inspection. It’s a fabulous piece of legislation that pre-dates the Coalition’s equally excellent transparency agenda. But curiously enough you won’t find any feature about it in the £1.5m pages of East End Life. Tower Hamlets council, like most other authorities, aren’t that keen for people to know about. However, they are required by law to place a public notice in a local paper advertising the dates when the inspection takes place in a particular year. This year’s advert, for the financial period April 2013 to March 2014, was placed in the back pages of East End Life on June 9…nine pages after that week’s restaurant review, for which a council worker was handed £40 for a nice meal. Under this legislation, anyone can ask to see the details of any transaction during the financial year in question. This includes seeing copies of any contract, purchase order or invoice or other supporting documents. So, if you were so inclined you could ask to see all transactions made for restaurant reviews in East End Life during 2013/14. You could ask for a list of all payments made for these reviews and view all invoices submitted by external contributors or expense claims submitted by staff. Some issues might still be subject to confidentiality clauses. For example, you won’t be able to ask for individuals’ salaries. You can ask for all salaries in a particular area but you won’t see names attached to them. The Data Protection Act still applies. However, this legislation allows for far more transparency than the both the Freedom of Information Act and the lists of payments to suppliers that councils must now publicise. So it gives us all a chance to have a look under those redacting pens. Under the Audit Commission Act, those black pen marks will have to be removed. The Act is a potential gold mine of information, but you only have until July 28 to submit questions and follow ups. 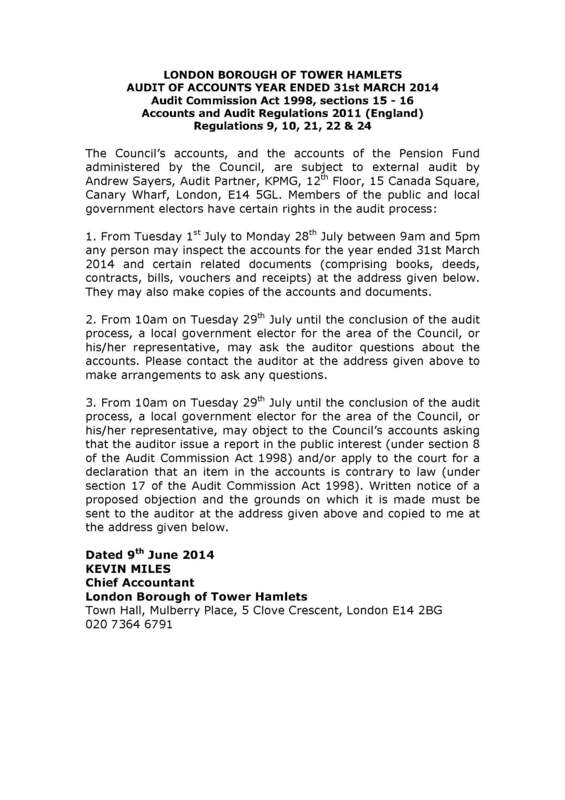 If you ask for information before then, the council must answer it even if that answer comes after July 28. However, the earlier you ask the questions the better. And a plea (for the sake of the accountants), be wise and judicious in what you ask for. Fishing expeditions are of course allowed but try to narrow your searches and questions. Think about what you want. For example, you might want to see a summary of all expenses submitted by officers and councillors for “entertaining” (councillors rarely submit such claims by the way). From that summary you might want to drill down into something by asking for copies of receipts for a particular meal. Which restaurant, what did they eat and who did they entertain? You might want to ask for copies of invoices submitted by a particular consultant or contractor. It might be a good idea to discuss on this blog what you or someone else might ask. Let’s co-ordinate questions. For my side, I’ve submitted an early batch of questions on Champollion, the lawyers Taylor Wessing and East End Life’s accounts. 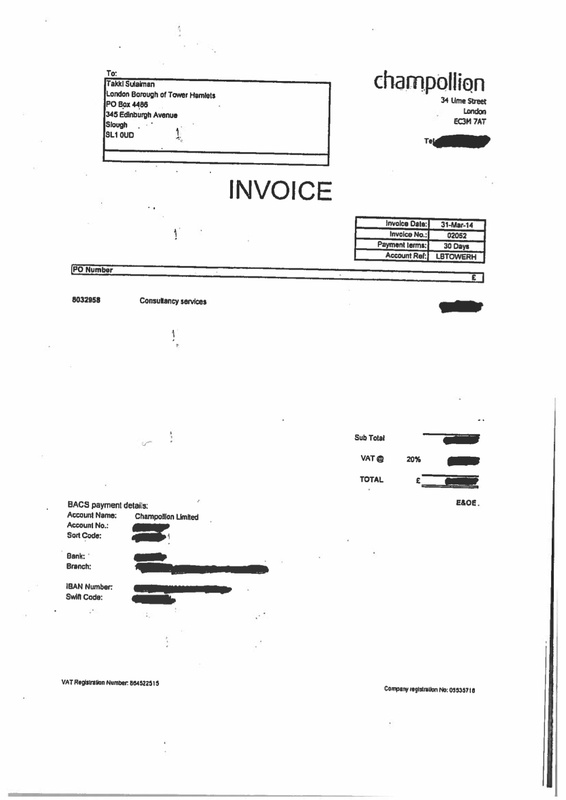 I’ve also asked for copies of invoices for Mayor Lutfur Rahman’s chauffeured Mercedes in the period. And I’ve also asked for any payments made to The Society of the Golden Keys during the year. What’s that, you ask? In March 2012 (I saw this some time ago, but had forgotten about it), the council’s communications department paid the Society £800 for membership fees. I was told it was on behalf of Takki Sulaiman, the £100,000 a year head of communications. I was told he attended dinners/events with the society. Here’s more about the Society, which is a membership group for hotel concierges in Britain. The Society of the Golden Keys in Great Britain is thriving. With strict conditions of membership requiring proof of professional relationships with guests and work colleagues, approximately three hundred and thirty concierges in Great Britain now proudly wear the symbol of their status: the Golden Keys lapel pin. Each is revered for his or her professional gravitas, integrity, local knowledge and impeccable recommendations. The Society encourages friendship and camaraderie and the members meet formally each month. The Ladies’ Night Dinner and Dance and the Anniversary Cocktail Party are the social highlights of the year for many of the leading figures in the hospitality industry, as well there are many other events which the society of the Golden Keys help to promote. The council told me it was important to have membership to boost tourism in Tower Hamlets. Perhaps it does. But it’s only fair that taxpayers know, and that’s what the Act allows.